Here’s the Electoral College map we’re going to end up with, assuming that every uncalled state goes to the candidate leading in the vote count there as of 4 p.m. Eastern time on Wednesday. There’s a sea of red for President-elect Donald Trump. He earned 306 electoral votes and became the first Republican since 1988 to win Michigan, Wisconsin or Pennsylvania. The Democrats’ supposed “blue wall” — always a dubious proposition — has crumbled. Indeed, with Hillary Clinton’s defeat, Democrats may have to rebuild their party from the ground up. But the Republican Party is also forever changed. The GOP has learned that there’s a bigger market for populism, and a far smaller one for movement conservatism, than many of us imagined. The Party of Reagan has been supplanted by the Party of Trump. America hasn’t put its demons — including racism, anti-Semitism and misogyny — behind it. White people still make up the vast majority of the electorate, particularly when considering their share of the Electoral College, and their votes usually determine the winner. One fact that doesn’t fit very well into this narrative is that Clinton leads in the popular vote count. She should eventually win the popular vote by 1 to 2 percentage points, and perhaps somewhere on the order of 1.5 million to 2 million votes, once remaining mail-in ballots from California and Washington are counted, along with provisional ballots in other states. In light of Trump’s narrow victory, these arguments sound extremely unconvincing. But they’re exactly what we would have been hearing if just 1 out of 100 voters had switched from Trump to Clinton. So consider that there might be at least partial truth in some of these points. Likewise, if Clinton had just that small, additional fraction of the vote, people would be smugly dismissing the arguments in the first set of bullet points — even though they, too, would have been just 2 percentage points away from seeming incredibly prescient. Interpretation of the polling would also have been very different. 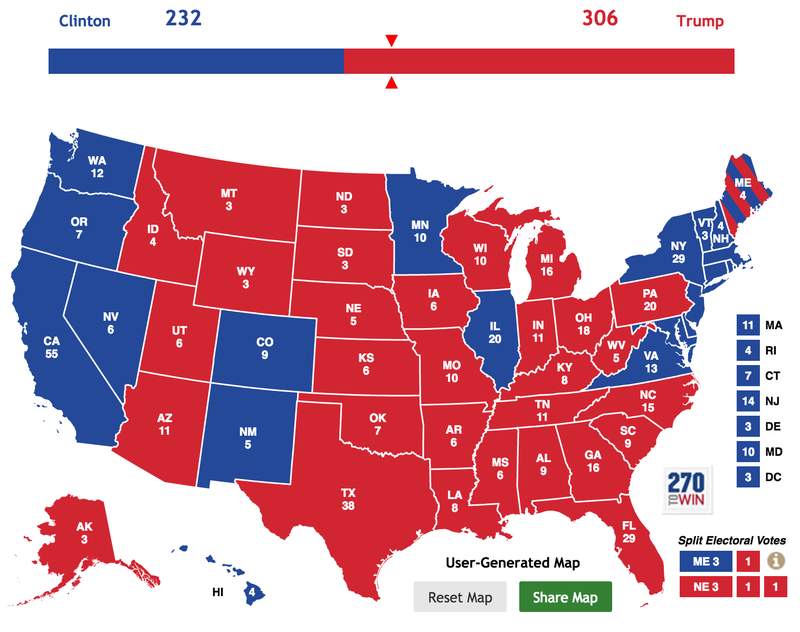 If Clinton had done just 2 points better, pollsters would have called the popular-vote margin almost on the nose and correctly identified the winner in all states but North Carolina. We’ll have more to say about the polling in the coming days. But to a first approximation, people are probably giving the polls a little bit too much blame. National polls will eventually miss the popular vote by about 2 percentage points, which is right in line with the historical average (and, actually, a bit better than national polls did in 2012). State polls had considerably more problems, underestimating Clinton’s complete collapse of support among white voters without college degrees but also underestimating her support in states that have large Hispanic populations, such as New Mexico.